Been a long time since I posted here. Have lots of recipes in my draft. Thanks to my naughty toddler, I just don’t get enough time to post quite often! Recently I made mango gojju with ripe mango. It was awesome!! Gojju [not gujju ] is a famous Karnataka cuisine recipe. Kannadigas make variety of gojju recipes. Some people say it as “Gotsu” but it should be called as “Gojju”. Gojju is prepared with tamarind extract (the main ingredient) and gojju masala. 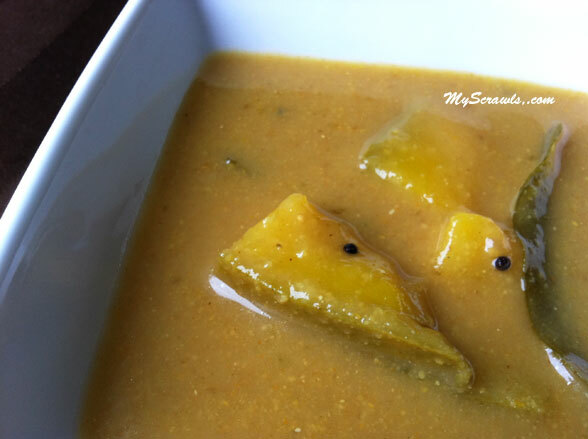 Tamarind in the recipe gives it sour/tangy taste and the gojju masala gives a spicy touch. Mango gojju is my favorite. You can prepare varieties of gojju by choosing the veggies accordingly like onion gojju, okra gojju and so on. The gojju masala is pretty much the same for all varieties of gojju. Wash and cut mango into small pieces. Add 1 cup of water allow it to boil. Meanwhile heat 1 tsp of oil and roast the gojju masala ingredients. Allow it to cool and finely grind gojju masala. Add this mixture to the boiling water. Add tamarind extract, turmeric and sambar powder to mango gojju. Dissolve jaggery in water (1-2 tsps) and add it. In the mean time, heat remaning oil in a separate vessel. Do seasoning with mustard seeds, hing and curry leaves. Add it to mango gojju and remove it from stove-top. 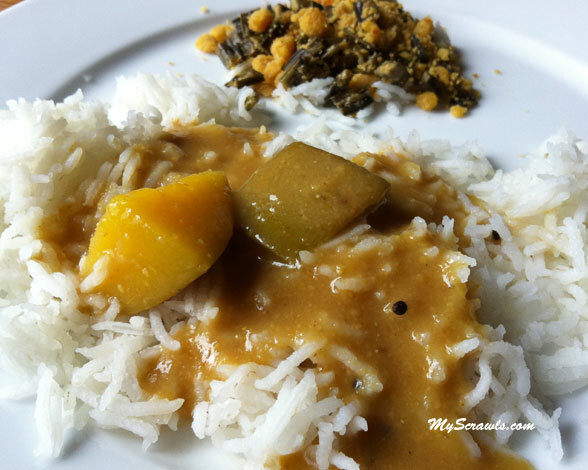 Serve mango gojju with hot rice. Adding rice flour: The gojju would have thick consistency. In case you feel it to be watery/thin, add rice flour. Mix rice flour with water (2-3 tsps), make sure that there are no lumps and then add it to gojju. Perfect! This recipe was the one I was looking for!